The term sensory processing disorder(SPD) is one that’s been buzzing quite a bit in recent years. It’s a complicated and frequently misunderstood topic as these children who have SPD can look so different from one another and will often display inconsistent behaviors themselves from day to day. what that information means, and then produce an appropriate response. For example, if you step on a tack, your tactile system sends the message that you’ve stepped on something sharp, you determine this is painful, therefore you quickly lift your foot and inspect the damage. Other responses are less reflexive and we react with learned or conditioned behaviors. Upon hearing a dog bark, many of us may orient our attention briefly to the sound before carrying on with our business. However, an individual who has had a negative experience with one of these animals may jump at the sound. His startle response can cause him to feel anxious until he feels assured he is out of harm’s way and has had enough time to move on from any negative association triggered by the sound. For some with sensory processing disorder, this heightened state of alertness is how they live most of their day. 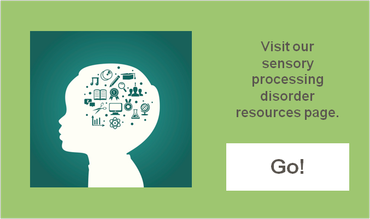 With sensory processing disorder, sensory information is processed in a disorganized way. We ALL have differences in the way we perceive our world; a smell that makes you feel nauseated may be one that another person seeks out. Or a favorite food of yours may have a texture that someone else can’t stand. This type of variation is normal. We begin to consider these differences to be a sensory processing disorder when an individual’s day to day life is significantly impacted by their difficulty taking in this information and producing an appropriate response. The result of which may be anxiety or hyperactivity, depression or sluggishness, clumsiness, difficulty with peer relationships, or struggles with schoolwork to name a few. Sensory Modulation Disorder: In this group, individuals experience sensation at varying levels of intensity and have difficulty regulating responses. They may be more sensitive to one or more sensations such as noise, touch, or movement, or on the other hand, they may have difficulty even registering this input. Within this category, we often see children who either seek out extra input or who avoid input many of us would consider innocuous. It can be confusing to dissect behaviors of these children. For example, those who are more sensitive to touch or noise may become overly upset by others standing too close to them or by noise produced by others, yet they are the children who don’t seem to understand personal space or are scolded for being too noisy themselves. Sensory-Based Motor Disorder: For these kids, disorganized processing causes less than optimal motor output. We may see issues with balance, motor planning, coordination, postural control and/or endurance. These are the kids who appear clumsy, lethargic, or have difficulty keeping up with their peers. Sensory Discrimination Disorder: Those in this group have a more difficult time perceiving details of sensory input. It may take them longer than average to determine exactly what they’re looking at, hearing, or feeling. This could be the child who appears awkward with many fine and gross motor tasks or who often seems unaware of his surroundings. Sensory processing disorder can look many different ways and children often fall within more than one category. We additionally have to consider which sensory systems are affected. In the remainder of the Understanding Sensory Processing Disorder series, we will touch on each system along with red flags and helpful strategies!